I’ll admit, I love Westerns: historically accurate they may not be, predictable they most definitely are, and overly romanticised I’m sure that they might be, but the appeal of anything featuring the triumvirate of horses, guns, and taciturn heroes has never quite diminished from its childhood level. 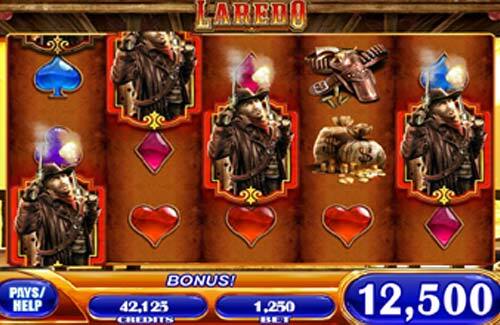 Williams Interactive Software has added their own entry to this genre in the form of Laredo, an enduringly popular casino slot that has made the transition to online as easily as Roy Rogers mounting a galloping pony. Westerns are known for featuring iconic soundtracks, and Laredo does this as well, with effects and music redolent of the Old West, which stand out in the cacophonous crowd of a rowdy gaming room. The tempo also picks up when winning combinations start appearing on the reels. Laredo is a 5 reel slot featuring 20 pay lines, making it simpler than other offerings from Williams like Neptune’s Quest or Giant’s Gold, with their innovative layouts. While the traditional card symbols appear on the reels for those of low rank, these do fit in well with the theme (imagine a cowboy movie without a poker game! ), rather than seeming a little hackneyed, as they do in others. Other symbols are more relevant still to the genre, such as horses, both real and iron, cowboys, a mounted sheriff, gun belts and damsels. The Wild gunslinger is an expanding one, and can cover a full reel, and there are also symbols that trigger multipliers and free spins. These are triggered by revealing Scatter Bonus symbols: 3 of these will award 8 free spins, 4 will reward you with 20 free spins, and 5 Scatter symbols will award you 40 free spins of the reels. During these free spins, there is the potential to set off a 10x multiplier, and access the Mega Big Win that features in many of Williams’ games, as a quick search of videos online can attest. With bonus reels activated and a maximum bet placed, this can quickly become more lucrative than robbing a stage coach (and safer, too). If you have played many of Williams Interactive’s slot games, this offering of Laredo may feel a little samey: it offers little in the way of bonus animation or innovative play on the reels, although it does offer the big payouts that the company is known for. But if you are a fan of Westerns, samey is good: it’s nice to know that the hero will always outdraw his opponent, even though he may take a beating to get there, and that ultimately he will choose the horse he rode in on over the women that may do him wrong. Laredo looks and sounds exactly like fans of the genre would expect a Western themed slot to do, and features good artwork and gameplay. It goes down like a shot of good whiskey, and will leave you with a swagger in your step. Make your best bet today!